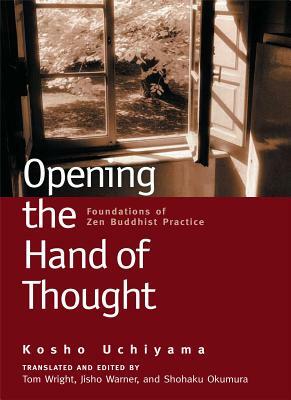 For over thirty years, Opening the Hand of Thought has offered an introduction to Zen Buddhism and meditation unmatched in clarity and power. This is the revised edition of Kosho Uchiyama's singularly incisive classic. This new edition contains even more useful material: new prefaces, an index, and extended endnotes, in addition to a revised glossary. As Jisho Warner writes in her preface, Opening the Hand of Thought "goes directly to the heart of Zen practice... showing how Zen Buddhism can be a deep and life-sustaining activity." She goes on to say, "Uchiyama looks at what a person is, what a self is, how to develop a true self not separate from all things, one that can settle in peace in the midst of life." By turns humorous, philosophical, and personal, Opening the Hand of Thought is above all a great book for the Buddhist practitioner. It's a perfect follow-up for the reader who has read Zen Meditation in Plain English and is especially useful for those who have not yet encountered a Zen teacher. Kosho Uchiyama was a preeminent Japanese Zen master, instrumental in bringing Zen to America. The author of over twenty books, including Refining Your Life, he died in 1999. Daitsu Tom Wright, born and raised in Wisconsin, lived in Japan for over forty years. He practiced and studied under Uchiyama Roshi from 1968 until the latter's death and was ordained as a priest in 1974. A graduate of the University of Wisconsin, he taught as a professor in the English Language and Culture Program at Ryukoku University in Kyoto. He was a teacher for the Kyoto Soto Zen Center until 1995, and then conducted zazen gatherings with Rev. Doyu Takamine in Kyoto and Tamba. Rev. Wright has worked on the translation and editing of several works on Zen, as well as writing on Zen, the Holocaust from a Buddhist perspective, and Japanese gardens (Samadhi on Zen Gardens--Dynamism and Tranquility, with Katsuhiko Mizuno, Suiko Books, Mitsumura Suiko Shoin, 2010). Retiring from the university in 2010, he now lives with his wife in Hilo, Hawaii, where he continues to work on translations and teach at Alaneo Zendo (Abbot Myoshin Kaniumoe) in Hilo. Jisho Warner is a Soto Zen priest and guiding teacher of Stone Creek Zen Center in Sonoma County, California, which she founded. A former president of the Soto Zen Buddhist Association, Warner trained for many years both in Japan and the United States. Having graduated from Harvard University in 1965, she was also a longtime student of Dainin Katagiri. She is also a co-editor of the book Opening the Hand of Thought by Kosho Uchiyama, whose teachings she encountered during the 1980s while practicing at the Pioneer Valley Zendo. She had also practiced for many years at the Milwaukee Zen Center under Tozen Akiyama (from whom she received shiho). Shohaku Okumura is a Soto Zen priest and Dharma successor of Kosho Uchiyama Roshi. He is a graduate of Komazawa University and has practiced in Japan at Antaiji, Zuioji, and the Kyoto Soto Zen Center, and in Massachusetts at the Pioneer Valley Zendo. He is the former director of the Soto Zen Buddhism International Center in San Francisco. His previously published books of translation include Shobogenzo Zuimonki, Dogen Zen, Zen Teachings of Homeless Kodo, and Opening the Hand of Thought. Okumura is also editor of Dogen Zen and Its Relevance for Our Time and SotoZen. He is the founding teacher of the Sanshin Zen Community, based in Bloomington, Indiana, where he lives with his family.